Spring is in the air and all the rain we had this winter had me feeling really cooped up. It was time to hit the trail and explore a new East Tennessee waterfall. I have an ongoing list of must-see waterfalls in Tennessee, and I enjoy checking them off the list each time I see a new one. Benton Falls was the next waterfall on my list. 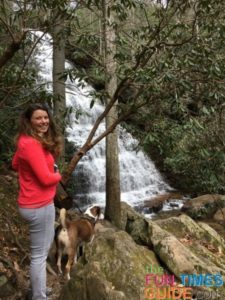 The Benton Falls trail is located in the Cherokee National Forest — exactly 60 miles southwest of my house. If you use the AllTrails app, the coordinates are automatically loaded into Google maps — so Benton Falls directions are a breeze from wherever you’re coming from. As we followed the directions, we came across the Gazebo Outlook on Benton Springs Road — just before turning onto Oswald Road. 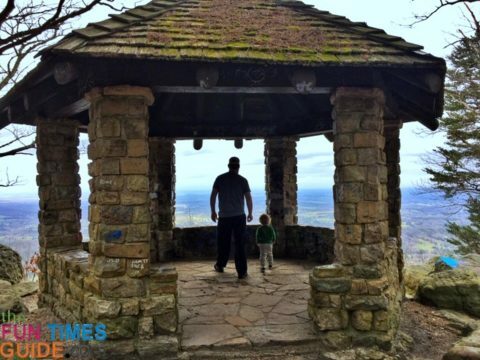 Depending which way you’re coming from, I highly recommend planning a stop at the Gazebo Outlook — either on your way in or out — as it’s only 2.2 miles from the Chilhowee Recreation Area. 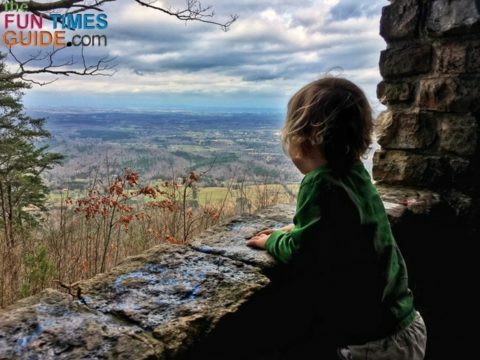 In fact, there are actually 3 different overlooks on the 7-mile drive to Chilhowee Recreation Area from US 64. Each one offers a slightly different perspective — with breathtaking views as far as the eye can see of Parksville Lake and the Appalachian mountains, all the way into Georgia and North Carolina. Once we arrived at the Chilhowee Day Use Area, we were prepared to pay the $3 day use fee, but there were no envelopes available at the self-serve kiosk. Luckily, the restroom facilities were open after the long ride in the car. Chilhowee Recreation Area has a wheelchair-accessible picnic area with views of McKamy Lake and restroom facilities at the main parking area. 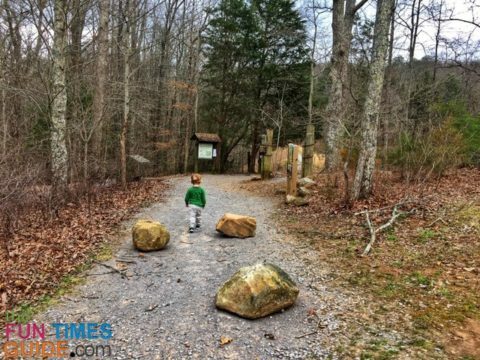 The Chilhowee seasonal campground with RV hookups is located there too — if you want to really explore the area! As you enter the trails, past the facilities, you will enjoy the McKamy Lake because you walk right past it. 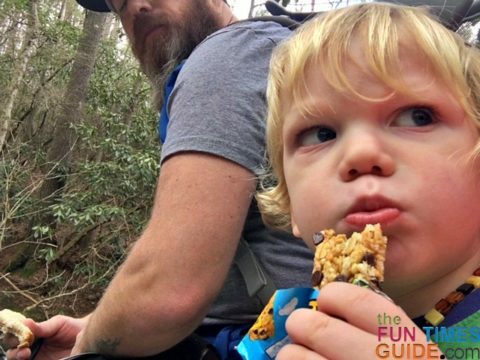 Our 2-year-old walked some of the trail near the lake — but he was packed on my husband’s back in our Osprey hiking carrier for most of our hike on the Benton Falls Trail. Benton Falls is the main trail running through the 25-mile Chilhowee Trail System. This trail is 3 miles round trip — which is plenty for us with a 2-year-old in tow. As we set out on our 1.5 mile hike to the falls, we knew we should be in a for an incredible display from this 65-foot waterfall — due to all of the recent rain in the area. The trail itself was mostly a smooth, sandy, and easy path. I think the average hiker could easily complete Benton Falls Trail within 1 to 2 hours. 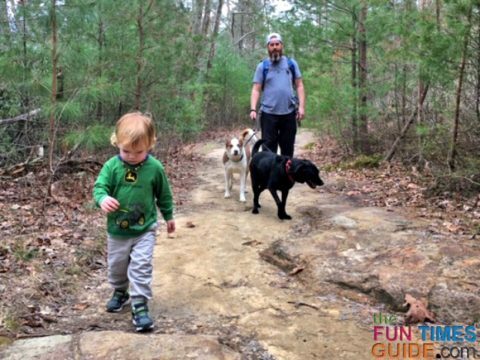 It’s a super easy trail that is ideal for any time of year. There were a few muddy spots here and there, but the bulk of the trail was sandy. 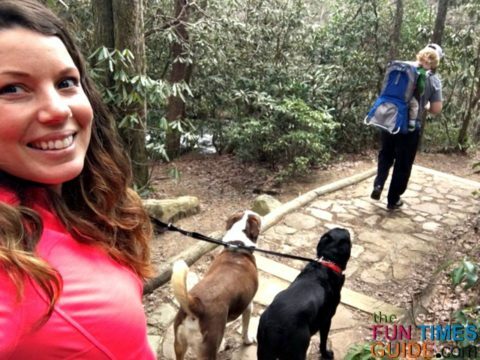 I love the fact that the Benton Falls Trail is dog-friendly, as long as the fur babies are on a leash. Our dogs enjoy going just about everywhere we go — so I always remember to pack poop bags, a collapsible water dish, dog treats, their collars, and their double dog leash. On this particular hike, I was reminded that I really need to incorporate a separate tie-out leash for when I want to free up my hands. That way, I could easily tie them up to a nearby tree without shortening their existing leash. An extra collar or seperate leash slipped around a tree and through the handle of the current leash would work perfectly, but I simply forgot to pack one this trip. Just before you reach the stairs near the top of the falls, there is a nice flat spot by the stream that turns into the top the falls. 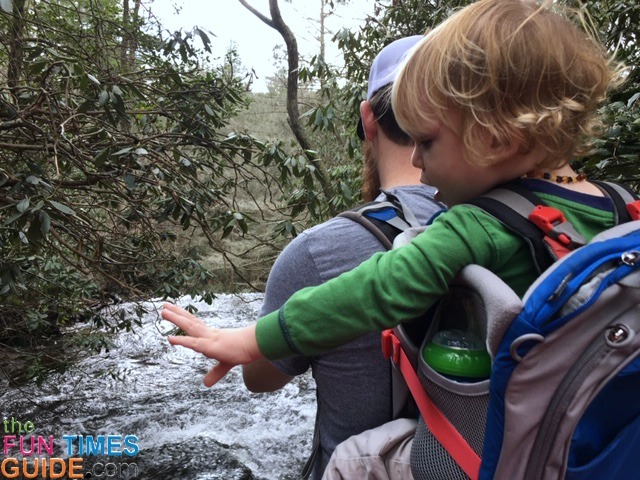 Make sure that you hold onto your kids (or pets) near the top of these falls — because there is no barrier over the edge! As you continue down the path, there is of a series of beautiful steps with a log handrail to the base of Benton Falls. My husband and I were both surprised to see the level of work that had gone into making these stone stairs. Of course stairs are always fine going down, but then there’s that moment when when you start thinking about the climb back up… with a toddler on your back. Thankfully, my husband was willing to pack our son for the trek up and down these stairs. When we got to the base of the falls, there were quite a few people already there — taking in the views, perched on a couple of rocks. I imagine this place becomes quite crowded in the summertime. There are not a lot of spaces available to sit and relax — unless you want to get adventurous jumping from rock to rock planted in the water. If you do find a place to sit, the base of the falls is where you want to be — to just sit and breathe in the falls! The sound of the roaring water is quite deafening near the base of the falls, especially with all the recent rainfall added to the rushing water! With our 2 dogs on a leash and our curious toddler in his hiking carrier, we could only enjoy the views here for a few minutes before we opted return to the flat spot at the top of the stairs — where we stopped for a quick snack, so our son could enjoy some time out of his carrier. If you are ever in the Benton TN area, then Benton Falls is definitely worth the trip! The hike is good for all skill levels, and you get rewarded with a gorgeous 65-foot waterfall. As I always say… so many waterfalls, so little time. I hope that I’ve inspired you to get out and explore. Please share your favorite waterfall in the comments below. We would love to hear about your adventures! And if you wish for more trails to explore… the good news is there are 25 miles of trails in the Chilhowee Recreation Area! 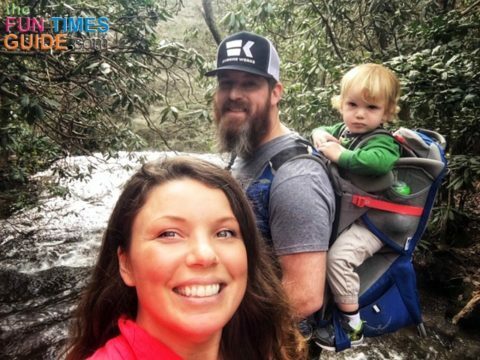 Every trail links to the Benton Falls and Clemmer Trail, making it easy to create a custom loop based on your own timeframe and the miles you want to hike. 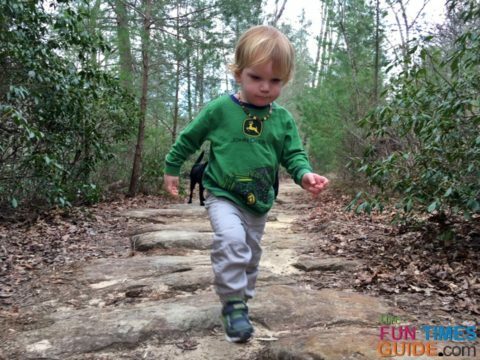 Here are my tips for finding hiking trails that are baby-friendly and dog-friendly.